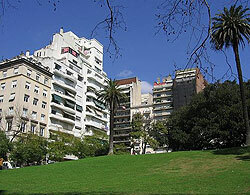 Recoleta is Buenos Aires’ premier address, the genteel enclave of the crème de la crème of Argentina’s wealthiest families. It is one of the most expensive residential neighbourhoods in the city both in terms of real estate and cost of living. The district is also known for the Cementerio de la Recoleta, rivaled only by the Pere Lachaise cemetery in Paris as a tourist attraction. This final resting place of Argentina’s most powerful denizens is the most exclusive in town (Eva Peron is buried here). However even dying in this district definitely doesn’t come cheap. This well-heeled neighbourhood is known for its numerous fin de siècle French colonial-style palaces and villas along the Avenida Alvear, its manicured parks, elegant squares, cafés and art galleries, and the National Fine Arts Museum which houses many pieces by important European Impressionists. Also among Recoletas’s fine mansions are embassies and the five-star Alvear Palace hotel, in which the famous Confiteria La Biera is located. The evenings are also quite busy in this neighbourhood, with trendy nightspots situated along the RM Ortiz passage, which is packed with outdoor dining restaurants, cinemas, and lively pubs.